Introduction: The dental needs of Indian Army personnel have been periodically assessed to aid planners in identifying the requirements for dental care resources and the best allocation of those resources to provide optimum treatment, whereas in Karnataka police service the personnel dental needs are neither assessed nor provided with treatment. Objectives: The aim was to assess and compare the oral health status and treatment need among personnel of Armed Forces of India in comparison with police services. 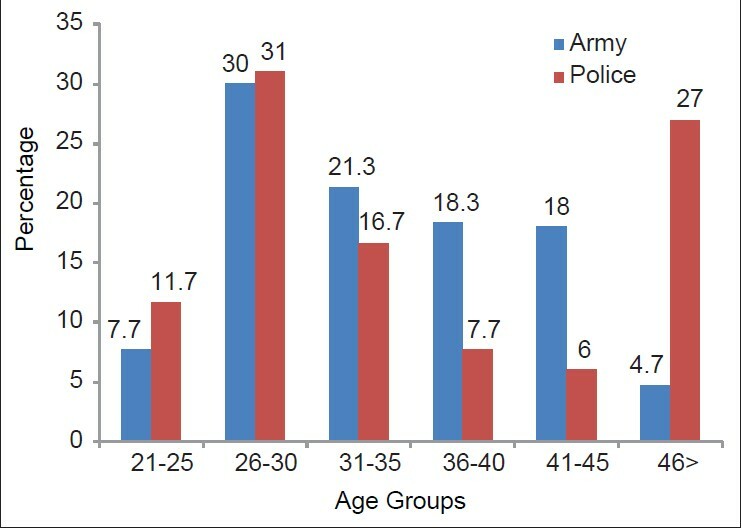 Materials and Methods: Oral health status was assessed among 300 personnel each from Indian Army and Karnataka police service using WHO proforma (1997). Study was conducted at ASC, Pioneer and Madras Engineering Group and Centre Bangalore for Army personnel and in 3 rd and 4 th battalion Bangalore for Karnataka state Police services. Results: About 45.3% of police personnel suffered from dental caries when compared to 42.3% of army personnel. The decay, missing and filled teeth of the army personnel was found to be 1.30 ± 2.33, and that of police personnel was 1.71 ± 2.67. About 37 (12.3%) army personnel had bleeding gums, 122 (40.7%) had calculus and 4 (1.3%) with pocket 4-5 mm compared with 38 (12.7%) police personnel with bleeding gums, 116 (38.7%) had calculus, 16 (5.3%) with pocket 4-5 mm and 5 (1.7%) with pocket 6 mm or more. Conclusion: The prevalence of the oral diseases namely dental caries and periodontal diseases was relatively high in police personnel when compared to the army personnel. Introduction: Professional college students should be more aware of their health. The simple concept of oral hygiene should be understood and put into practice by them. Objectives: To assess the dentition status and treatment needs of engineering students in Lucknow city. Materials and Methods: A total of 500 subjects were included in the study. 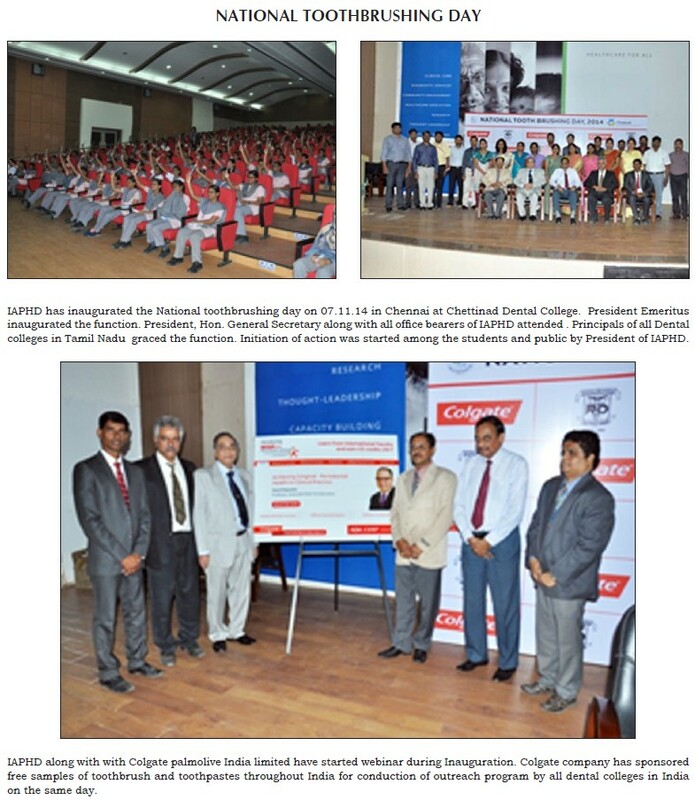 The subjects were selected from four Engineering colleges randomly selected from all parts of the city. Data were collected by using oral health assessment form by WHO (1997). The proforma included questions on oral hygiene practices, dentition status and treatment needs. Statistical analysis was performed using Statistical Package for Social Sciences version 15.0. 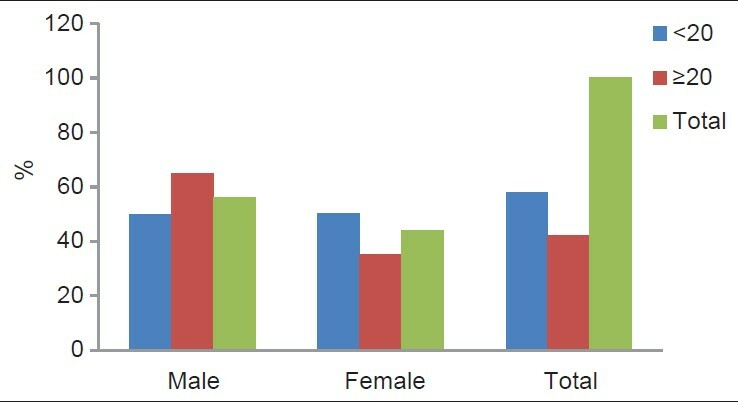 Results: Among the total subjects, 56% of the subjects were males and 44% were females in the study. Decayed teeth were found among 52.8% of the subjects in the present study. However, frequency of filled teeth (4%), missing (4.8%), bridge abutment (0.4%) and trauma (5.2%) was small. One surface filling was required among 26.4% of the subjects, 2 or more surface filling was required among 8%, crown for 5.2%, pulp care was 6.4% and extraction was required in 4.4% of the subjects. The decayed, missing, and filled teeth score among male subjects was 1.02 ± 1.20 and females 0.82 ± 0.94. Conclusion: The dental caries among the engineering students was found to be high and were more in males when compared to the females. Introduction: The dental profession has been considered a stressful occupation. The origins of this stress may also lie in the process of dental education. The perception of stress is frequently influenced by one's personal system of beliefs and attitudes. 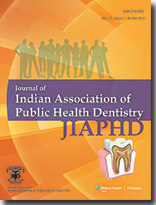 Aim: The aim was to assess the relationship between psychological well-being and perception of stress among undergraduate dental students in Bangalore city. Materials and Methods: A cross-sectional questionnaire survey was conducted among 800 1-4 th year dental students. Information on demographics, social background, and health behaviors were collected. The psychological general well-being (PGWB) index and the dental environment stress (DES) questionnaire were used to measure PGWB and perceptions of stress, respectively. Multiple intergroup comparisons were carried out using ANOVA. Correlation analysis was done to find out relationship between PGWB and DES. Regression analysis to find out the strongest predictor of PGWB. P <0.05 was considered as statistically significant. Results: There was no significant difference in PGWB among different year of study. Female students had significantly lower PGWB scores and higher DES scores than male students. The stress differed among different year of study with highest stress in final year students in all domains except for clinical/preclinical training, which was highest among 1 st year students. Correlational analysis showed a negative relationship between PGWB and DES score. Stepwise multiple regression analysis revealed that "workload," "patient treatment," "performance pressure" and "others" domains of stress were significant predictors of PGWB. Conclusion: This study revealed that the perception of stress is influenced by gender and health behaviors which in turn affect PGWB. Introduction: Career is the progress and actions taken by a person throughout lifetime, especially those related to that person's occupation and are often composed of the jobs held, titles earned and work accomplished over a long period of time. It plays a very important role in the success of once life. Aim: The aim was to compare the career satisfaction among medical and dental graduates in a private institution in Indore city, Madhya Pradesh. Materials and Methods: The study included a total of 100 medical graduates and 100 dental graduates and was carried out using a self-administered questionnaire. Chi-square test was performed for statistical analysis. Results: In medical profession, it was found that majority (87%) of the graduates were satisfied with their career. Majority (88%) of the graduates believed that their profession had a bright future 10 years from now and majority (74%) recommended joining medical profession as a safe and bright career alternative. On the contrary, in dental profession, it was found that more than half (53%) of the graduates were unsatisfied with their career. More than 50% of graduates believed that dental profession did not have a bright future 10 years from now and majority (66%) of the graduates recommended not to join dental profession. The differences were found to be significantly associated between the two groups (P < 0.05). Conclusion: The dental graduates were found to be dissatisfied with their career compared with medical graduates. Better job perspectives and better placements needs to be created. Endorsement of effective policies is required. Introduction: Yenadis are one the major tribe of Andhra Pradesh. They are special community people with low socioeconomic status (SES) and they do jobs like collecting trash from garbage for their livelihood. Their life style, livelihood practices may have an impact on their oral health. Aim: The aim was to assess the impact of SES on oral health related quality of life in yenadi's community. Materials and Methods: A total of 156 adults residing in Yenadi colony in Guntur city were interviewed with oral health impact profile-14 questionnaire which was translated to local language, followed by clinical examination for dentition status and periodontal status. Data from subjects who were missed on the day of examination were collected on consecutive days. Demographic details, oral hygiene practices and personal habit details were collected. Results: Sufficient reliability (0.8) and validity were demonstrated for questionnaire. The associated factors effecting quality of life are gender (P = 0.02), age (0.005), SES (0.001), oral hygiene aid (0.001) and personal habits (P = 0.001). The mean decay missing filled total value of the study subjects was 3.69 ± 2.4. Among the study subjects, 52.7% of study subjects had calculus, and 25.6% of study subjects had pockets >6 mm or more. Conclusion: This study revealed high level of oral disease and poor perception of oral health among the people residing in that area, which is due to lack of knowledge of existing problems. Background: A teacher with adequate oral health knowledge, positive attitude toward dental health can always play an important role in health education of school children and be a role model for children, lay people and the community at large. Objective: To assess and compare the oral health knowledge among English and Telugu medium primary school teachers in Hyderabad and Ranga Reddy districts of Andhra Pradesh. Materials and Methods: A cross-sectional questionnaire study was conducted among 300 primary school teachers selected from two districts of Andhra Pradesh. A combination of cluster and systematic random sampling technique was employed for the selection of study participants. The data on oral health knowledge, attitude and practices (KAP) were collected by two investigators using a structured questionnaire. The data were entered onto a personal computer, and statistical analysis was done using SPSS version 20. Results: A total of 150 school teachers each from English (62 males and 88 females) and Telugu medium (62 males and 88 females) schools participated in the study. By considering the oral hygiene aid used and frequency of brushing, it was evident that the oral hygiene practices were better among English medium teachers compared to their counterparts in Telugu medium. The teachers in English medium had favorable attitudes toward dental health than teachers in Telugu medium. Conclusion: The study found English medium teachers to be having better oral hygiene practices, more frequent dental visits, and better awareness about first aid in dentistry. However, the lack of preventive attitude, lack of motivation to be role models for children in oral health maintenance, reflect that there is a tremendous need to improve the oral health KAP among schoo teachers. Introduction: Dental trauma is one of the most important oral health problems in children. Most of the time these unwanted situations occurred in school premises. Hence, school teachers are the first to attend these incidents. Aim: To evaluate the knowledge of school-teachers in Lucknow with regard to emergency management of dental trauma. Materials and Methods: This cross-sectional study included a total of 162 teachers from different private and public schools of Lucknow, which was divided into 4 zones. Two schools were randomly selected from each zone. 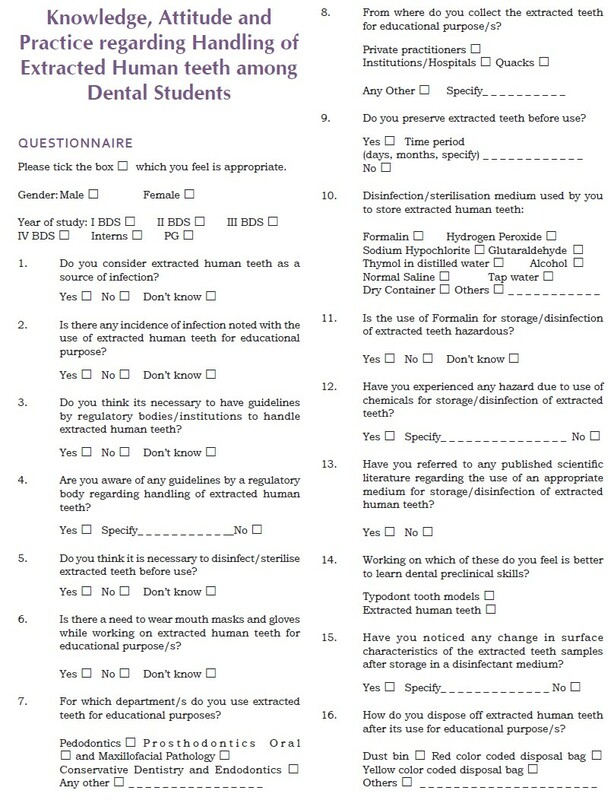 Questionnaire was used to collect information regarding teachers' educational background, gender, type of school, attitude and practices about dental trauma. 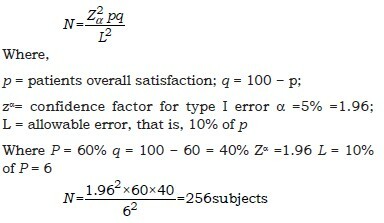 The reliability of the questionnaire was tested by the Cronbach α coefficient. Chi-squire test was used to assess the association between the overall knowledge score and demographic profile of school-teachers. Results: Majority of participants had received tertiary education. Maximum (80%) school teachers in the age group of 30-40 years had "fair" knowledge regarding implantation. Only 31% female-teachers had "good" knowledge about cleaning of avulsed tooth. Nearly, two-third of public school teachers (73%) had a "fair" overall knowledge, whereas approximately half (52%) of school teachers in private school had an overall "good" knowledge regarding the management of traumatic dental injuries. Conclusion: Majority of the school teachers have "fair" level of knowledge regarding the management of dental trauma. With more of educational campaigns like teachers training programs, there can be further enhancement of the knowledge that in turn can help teachers to handle these kinds of situations in a much better way. 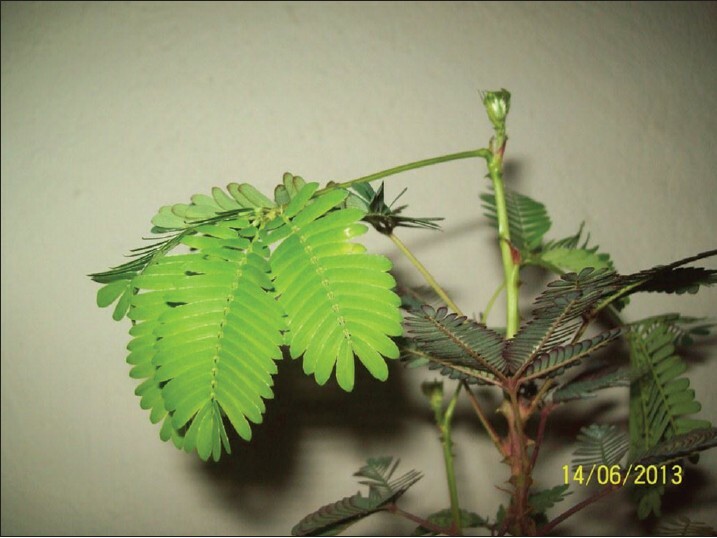 Introduction: The Mimosa pudica plant also known as "touch me not" plant, "shame" plant or laajvanti is a widely grown perennial herb as a show plant because of the mysterious action of its leaves which closes when touched. Mimosa pudica is also known for various medicinal purposes such as treatment of depression, piles, insomnia and many more. It has also been used for dental purposes. Literature shows evidence of its use for dental decay, bleeding gums throughout India and worldwide. Materials and Methods: Mimosa pudica plant whole aqueous extract in 10%, 20% and 5% concentration, chlorhexidine mouth wash as control, Streptococcus mutans (Microbial Type Culture Collection). Using agar well method the efficacy of Mimosa pudica extract was tested. Results: The plant extract couldn't show efficacy as the microorganisms didn't show any growth. Conclusion: The potential of this drug needs further investigation. Introduction: The major reason for decline in dental caries across globe is because of widespread use of fluoride dentifrices. For a fluoride dentifrice to be effective in the control of dental caries, an adequate concentration of the fluoride must be soluble. Objective: To assess soluble fluoride and total fluoride content in selected commercial dentifrices in Davangere. Materials and Methods: The soluble fluoride and total fluoride content in six selected commercial dentifrices in Davangere were assessed and expressed as ppm of fluoride (F) (mgF/g). Total fluoride and soluble fluoride was determined using an ion-specific electrode. Descriptive statistics applied to assess the mean total fluoride and soluble fluoride. Results: The total fluoride and soluble fluoride concentrations were approximately near to 1,000 ppm. Among the six dentifrices evaluated, four contained sodium fluoride (NaF) and two contained sodium monofluorophosphate (Na MFP) as fluoride compound. Conclusions: All the fluoridated dentifrices evaluated in this study contain adequate amount of soluble and total fluoride. Introduction: Ignorance regarding oral diseases and oral health can be a major cause for a high prevalence of oral diseases. Parents' attitudes have a significant positive influence on the children's oral hygiene and oral health. Objectives: To assess the mothers' oral hygiene knowledge and practice and its impact on oral hygiene status of their 12-year-old children. Materials and Methods: A total of 900 children, 12 years old and their mothers were selected by random sampling from 10 administrative wards of Mathura city. The general information and data regarding mothers' oral hygiene knowledge and practice were obtained by personal interview using a pretested questionnaire. Clinical examination of the subjects was done using oral hygiene index-simplified (OHI-S) for both children and mothers. The data obtained were analyzed using SPSS (Statistical Package for the Social Sciences), version 11.5 for windows. 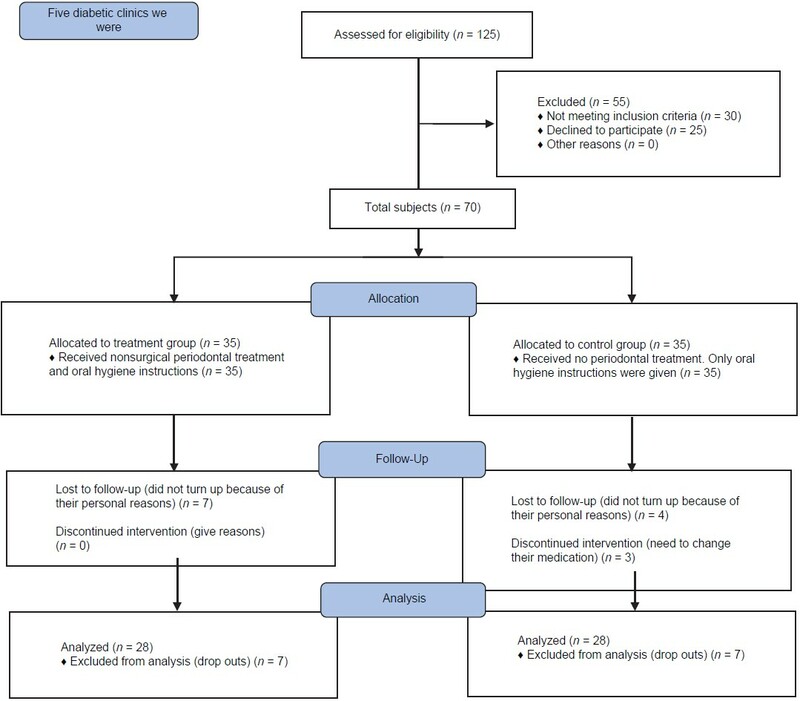 One-way ANOVA and independent t-test were used to find out the impact of mothers' oral hygiene knowledge and practice on oral hygiene status of their 12-year-old children. Results: Mothers' oral hygiene knowledge was found to have a significant impact on oral hygiene status of their 12-year-old children. There was a significant difference in mean OHI-S score of children with mothers who had poor oral hygiene knowledge (1.1650), fair oral hygiene knowledge (0.8947) and good oral hygiene knowledge (0.6431). Mothers' oral hygiene practices also had a significant impact on the oral hygiene status of their 12-year-old children. Conclusion: Mothers' oral hygiene knowledge and practice had an impact on oral hygiene status of their 12-year-old children in Mathura city.